1. The Gracekeepers by Kirsty Logan | I swear, this story is actually really intriguing, but it’s one of those things that I have to be in the mood for… and it’s so different than anything else, that I’ve never really been in the mood for it. 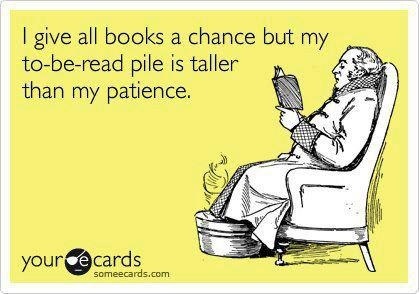 I still keep it in my TBR pile, hoping I’ll read it someday! 2. The Devil Wears Prada by Lauren Weisberger | I LOVE the movie & I want to like the book just as much, but I’ve never been able to get into it enough to actually finish it. 3. Unbecoming by Rebecca Scherm | No. I just… I can’t! I tried just forcing myself through the first few chapters, but there were so many spelling errors and it was SO confusing. Never again. 4. On the Jellicoe Road by Melina Marchetta | I’ve wanted to read this for so long, but every time I start it? I don’t connect with the characters and give up. I’m very much ‘that person’ that has to have a connection or intrigue within the first couple of chapters, and I don’t get that with this. 5. Between the Devil and the Deep Blue Sea by April Genevieve Tucholke | For the past couple of years, right around Halloween-time, I pick this book up again and try to push myself through it. It just seems so Halloween-y to me! Creepy & gothic & horror filled wonderfulness. Perfect! But I just can’t, so this year I’m not going to try. 6. Beauty Queens by Libba Bray | I just could. Not. Finish. I understand that it was a feminist parody and was supposed to be funny—but I couldn’t handle it. 7. Fifty Shades Darker by EL James | I read the first one, but as soon as I figured out that it was essentially Twilight fanfiction…I couldn’t get halfway through this book without picturing Edward and Bella. Not to mention the controlling, abusive relationship was just nauseating. 8. Me Talk Pretty One Day by David Sedaris | Another example of a very popular book that sounded great — until I tried reading it and just couldn’t do it. I don’t care for David Sedaris. I get that I should — I’m sarcastic, young…but nope. 9. Chivalrous by Dina Sleiman | Couldn’t get over the over-the-top religiousness of this one. I don’t mind some religion in my books — after all, it’s a major pillar of society. But this one was too much. 10. A Whole New World by Liz Braswell | This weird written version of the Disney movie of Aladdin was…weird. It was almost fanfiction but I swear straight up quoted the damn movie sometimes. Couldn’t do it!